The number of servers on location has declined and cloud hosting is gaining in popularity. 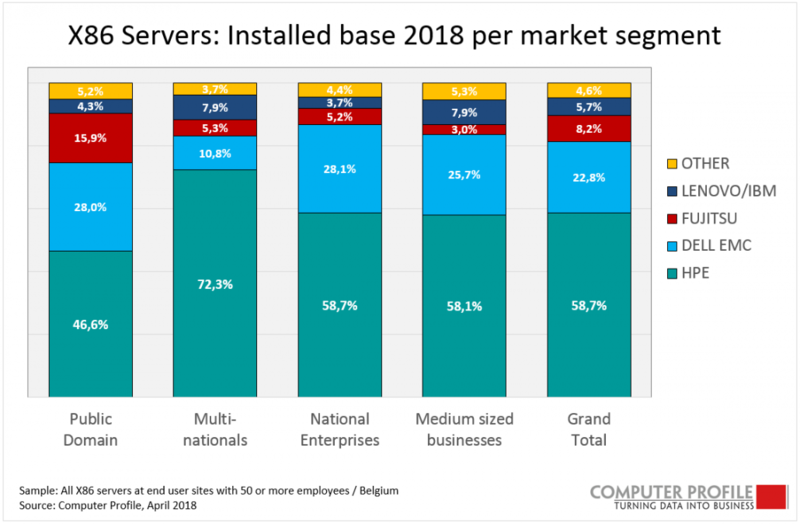 Nevertheless, Belgian companies prefer to keep their servers local, as shown by a market analysis conducted by market intelligence specialist Smart Profile, where more than 2,700 Belgian companies with more than 50 employees were interviewed. 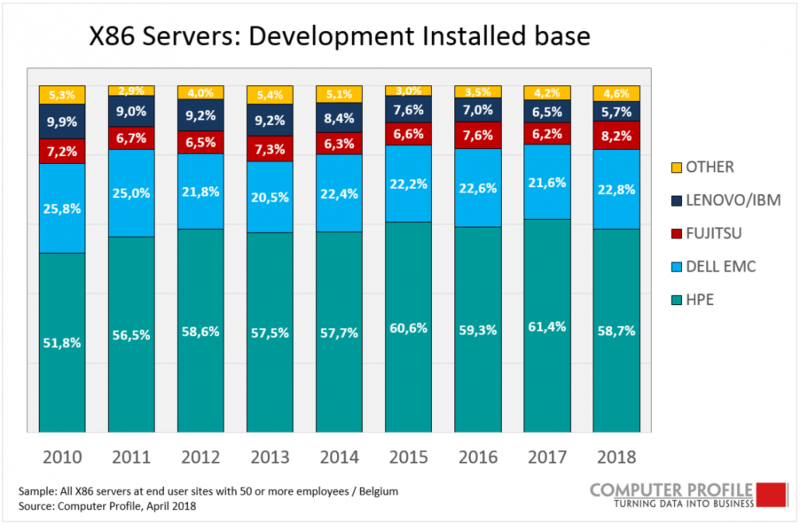 The number of Belgian companies that keep (mainframe, midframe, midrange and X86) servers on their own premises is declining. In 2010, 97.5% of the companies interviewed had their servers on their premises. In 2018, this percentage has dropped to 83.9%. Compared with our northern neighbours, this decline is minimal, as the figures there have gone from 97.3% in 2010 to 57.6% in 2018. Considered by sector, education tops the rankings with 89.8% servers locally. Finance (77.1%) and ICT (77.2%) have the fewest servers on location. Furthermore, cloud hosting has gradually got beyond the hype. Eight years ago, this phenomenon was still unknown. In 2018, the penetration of public and private cloud servers has risen by 9% on average in all organizations and sectors. Analyses per sector have revealed certain outliers. 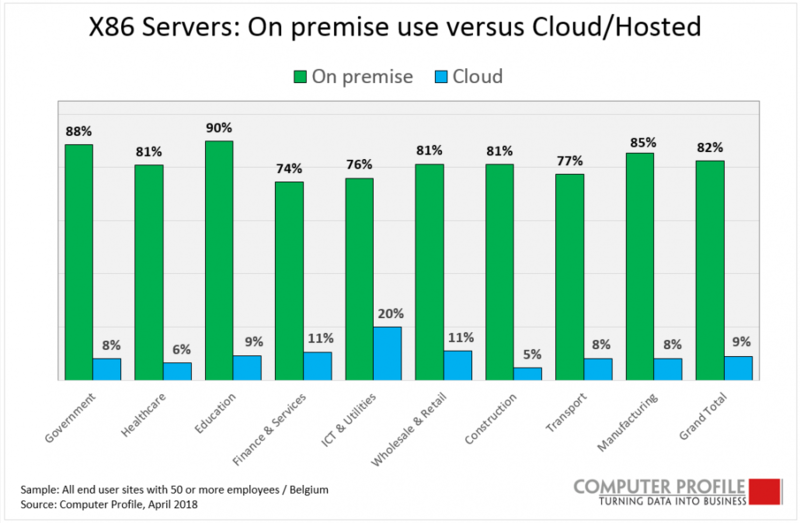 For instance, in one year’s time, the number of cloud-hosted servers in ICT, telecom and utilities sector has gone from 3.8% to 20.0% and wholesale and retail registered an increase from 2.9% to 10.9%. The financial and business services sector also registered an increase from 3.2% to 10.6%. In Belgium, the use of high-end (mainframe and midrange) severs has dwindled. Only 18% of business establishments use high-end server systems, locally or in a datacentre at another location. In 2010, the penetration rate amounted still to 33.4%. Here once again, there is a big difference with the Netherlands, where only 9% of comparable business locations still use a high-end system. The most widely used high-end servers are those of IBM, with an installed base of 80.7%, followed by Oracle with 10.5%. The use of X86 servers on location continues to dwindle also, but here once again to a lesser degree than in the Netherlands. In 2010, 96% of Belgian and 96% of Dutch business establishments indicated that they used X86 servers on their premises. In 2018, this figure is 82% among Belgian establishments, and only 57% in the Netherlands. When we look at the installed base at Belgian companies, we notice little change through the years. HPE remains the biggest supplier, followed by Dell EMC (22.8%) and Fujitsu (8.2%). With the sale of the desktop/laptop branch to Lenovo, IBM finally withdrew from the X86 market. The figures show that the share of Lenovo/IBM is declining slowly and that Lenovo no longer has such a strong market position. The penetration rate of X86 servers is the highest among SMEs (93.1%), and the lowest among national companies (70.9%). HPE has the biggest share of servers on location among multinationals (72.3%). In the public sphere, HPE has a share of only 46.6%.